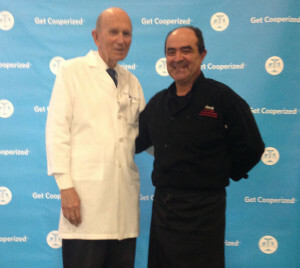 Dr. Kenneth Cooper, founder and Chairman of Cooper Aerobics and Chef Gorji at Cooper Nutrition Expo 2015 where Gorji demonstrated some healthy cooking tips by grilling okra and making his skillet pizza with his award-winning Gorji Gourmet Foods sauces. March is National Nutrition Month and Canary By Gorji restaurant and Gorji Gourmet Foods® participated in Cooper Clinic‘s Cooper Nutrition Expo, Monday, March 2, 2015. This was Cooper’s 8the annual, not-for-profit community event with a mission of sharing healthy foods, recipes, new products and ideas. There was information from Cooper Clinic’s Dietitian Nutritionists, specialty booths on weight loss, diabetes, body fat measurements, blood pressure checks, gluten-free information, massages, healthy food vendors and cooking demos. At the event, Chef Gorji demonstrated some healthy cooking ideas by grilling okra and carrots with Gorji Gourmet Dipping Oil/Marinade and made his skillet pizza with the award-winning Gorji Gourmet Foods Pomodoro and Arrabiata Diavolo, which have no preservatives or added sugar. He has long been a proponent of good ingredients, great taste and simple cooking techniques exemplified by the new mediterranean menu at his fine dining restaurant, Canary By Gorji and Gorji Gourmet Foods. The healthy, flavorful vegetables and pizzas that he presented at the Cooper Nutrition Expo were well received and reinforce his belief that people enjoy these modern, cleaner, less sugary tastes that he talked about in an interview with the Gourmet Retailer.Read the article here: https://gourmetretailer.com/dishing-out-flavor. National Nutrition Month® is a nutrition education and information campaign created annually in March by the Academy of Nutrition and Dietetics. “Bite into a Healthy Lifestyle” is the 2015 National Nutrition Month theme. The campaign focuses attention on the importance of making informed food choices and developing sound eating and physical activity habits. No Replies to "Cooper Nutrition Expo |Healthy Cooking Event"